The most common types of breed-specific legislation adopted by cities to regulate dangerous dog breeds, primarily pit bulls, are breed bans, prima facie legal designations and sterilization laws. The most controversial pit bull ban in the U.S. was enacted by the City and County of Denver in 1989. Over the course of 25 years, the ban has withstood numerous battles in state and federal courts. On each occasion, the City and County of Denver has prevailed. The litigious history of the ban, and Denver's consistent victories, has helped many cities adopt similar laws. 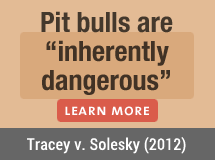 The Denver pit bull ban is undoubtedly the beacon that illustrates the legal viability of breed-specific pit bull laws. Some cities adopt pit bull ordinances that prima facie designate the breed "potentially dangerous," which triggers special rules for all pit bull owners. Little Rock requires these owners to obtain a potentially dangerous breed permit, a city license and a window sticker on an annual basis and to provide proof that the dog is sterilized and microchipped. Pit bull owners are also prohibited from using invisible fences and households are limited to two potentially dangerous breeds per home. Other cities adopt ordinances where pit bulls are prima facie designated "dangerous" or "vicious," which usually sets the bar higher than the "potentially dangerous" label. Fayetteville, for instance, declares all pit bulls "dangerous" and requires the dogs to be muzzled when off property and when penned outdoors, contained in a structure with secure sides and a top or all sides must be eight feet high. Owners must also post a Beware of Dog sign and carry $100,000 in liability insurance. Learn more about each breed-specific ordinance type in our Breed-Specific Legislation FAQ. Other municipalities opt for "tough" generic dangerous dog laws instead of breed-specific laws.5 Such laws hold dog owners criminally negligent after a serious or fatal dog attack. The key word in this instance is "after," which is why we call them "hindsight" laws. Policymakers hope that after enough people are sent to prison, there will be a deterrent to dog owners, whereby forcing them to be more responsible. The downside is that many new victims are created in the process. See: Dog bite attorney Kenneth Phillip's website for additional discussion about Lillian's Law. Statistical information provided by Council Bluffs Animal Control Department, October 2016. Texas is one of nineteen U.S. states that prohibit local governments from enacting breed-specific ordinances. Learn more about state preemption laws. The first conviction under Lillian's Law occurred after the death of Tanner Monk. In 2011, the 11th Court of Appeals upheld the conviction of the dogs' owners, Jack Smith and Crystal Watson.